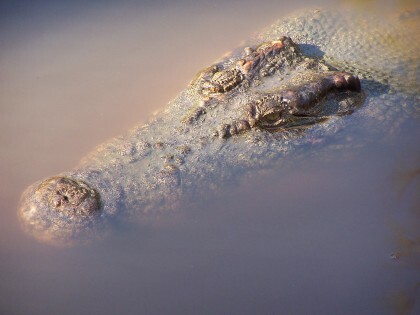 Crocodiles live naturally in tropical areas. They need their stomach to be above a certain temperature in order to digest their meals, so captive crocodiles outside of the tropics always have a warm place to retreat to (heat-lamps or buried heat-cables) after feeding. Two species are found in Australia – the big salt-water crocodile (found from India through Southeast Asia to Australia, the biggest crocodilian in the world, and one of the few Australian native animals to see humans as prey), and the much smaller freshwater (or Johnstone) crocodile, found only in Australia, but with a closely-related one in New Guinea. NOTE: Seriously, there have been a number of visitors eaten in the past. Large crocs can be well-concealed near the edges of rivers, and they have the strongest jaw pressure of any living animal and powerful tail muscles to propel them suddenly from the water to grasp their prey. Do NOT sit or stand next to any body of water that may harbour a croc, and don’t even think about swimming there! Hartley’s Crocodile Adventures (Far North Qld): large wildlife park, crocodiles seen resting on bank of moat as you cruise through the park. Both species.